On April 20th at 10:19 a.m., Kennedy students, along with other schools across the nation, took part in a walkout out in remembrance of the 20th anniversary of the Columbine mass shooting, an event that lead to the loss of 13 lives. As JFK students left their classrooms and were directed to the front entrance of the school where Seniors Danke Stroup, Cole Klein, Sarah Faraj, Malissia Bordeaux and Billy T. Hernandez, helped facilitate an open mic forum. Danke Stroup, gave an impassioned and informative meditation on the Republican Congress members who have received money from the NRA, the same organization supporting gun laws that would supposedly increase the likelihood of similar shootings. Many of the same Republican Congressmen released conciliatory tweets after the events of the Parkland shooting, an event that had acted as a major source of the fervor among many anti-gun activists taking part in the April 20th Columbine Walkouts. After the open-mic, students taking part in the walkout were encouraged to register to vote through a non-partisan organization. Students were not encouraged to register for any particular party, but rather simply take part in our democratic system, regardless of their political affiliation. Those who had already registered or were not registering during the event were given materials to create signs and banners covered with various slogans and deliberations on issues related to gun control and the NRA. Despite all of the energy displayed on that day, it is important to recall the roots of the demonstration. When asked what she thought about the protests, Kennedy senior Sienna Carrillo said, “I think we are showing people that we know what we are doing, and we see that there is a problem happening”. Carrillo continued with a widely acknowledged issue amongst young Americans, “By protesting we are showing that we want them to do something, we need [Congress] to change if they want to stay in office”, corroborating the common belief that many legislators, mostly on the Republican side of the aisle, are not working towards young America’s best interests. The walkout lasted until the end of the school day, admittedly losing much of the momentum it began with earlier that day, but the message of the day remained. 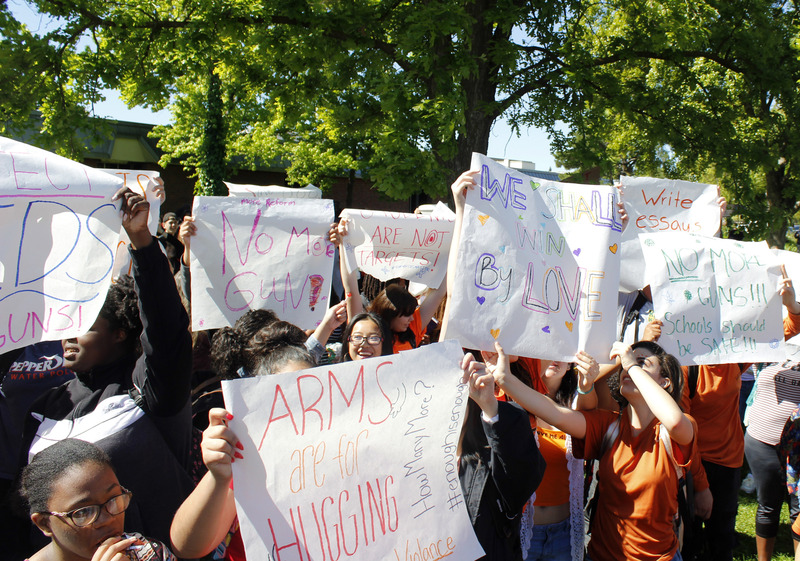 The walkout grabbed the attention of Sacramento officials, as local news sources The Sacramento Bee and KCRA3 reported on the events, alongside some of our own Kennedy Clarion reporters. The message that America needs gun control was clearly the leading issue on the minds of those Kennedy students participating in the walkout on April 20. Branden Messick (12) and Daniel Fuentes (12) urge their fellow JFK students to register to vote. Students cover one front entrance to the school campus with their names to prove they participated and supported the student walkout. Anaise Smith (10) expresses her voice through her anti-gun poster message. Kennedy students let their voices be heard as they march around the school campus. A student wrote in chalk at the entrance to the staff parking lot to bring attention to the need for a change in gun laws.